January 6, 2010 - Mesa Air Group, Inc. announced that it has commenced a financial restructuring through the voluntary filing of petitions to reorganize under Chapter 11 of the U.S. Bankruptcy Code in the United States Bankruptcy Court for the Southern District of New York (the “Court”). During the restructuring, the Company will continue to operate as normal, without interruption, which includes its code-share agreements with its partners US Airways, United Airlines and Delta Air Lines. Mesa’s go!-Mokulele joint venture, an independent Hawaiian inter-island operation, is not included in the filing and will continue to operate its full flight schedule. “Founded in 1982, Mesa has grown from a company operating a single seven passenger airplane into one of the largest independent regional air carriers. We were one of the first airlines to operate regional jets and pioneered the “revenue guarantee” business model – both now standards in the industry. This process will allow us to eliminate excess aircraft to better match our needs and give us the flexibility to align our business to the changing regional airline marketplace, ensuring a leaner and more competitive company poised for future success,” said Jonathan Ornstein Chairman and Chief Executive of Mesa. 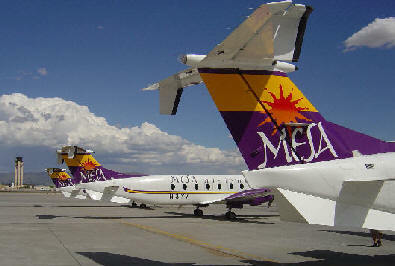 In 2005, Mesa was named ‘Regional Airline of the Year’. After careful consideration, the Company determined that a Chapter 11 filing provides the most effective and efficient means to restructure with minimal impact on the business and our customers. To ensure the Company operates without interruption, Mesa is seeking authority from the Court to continue all of its normal operations. The requests include authority to continue to pay employee salary and benefits, fulfill code-share partner agreements, honor customer programs, and pay vendors and suppliers for post-petition goods and services. These requests are standard and the Company anticipates receiving approval in the next few days. Vendor and supplier invoices incurred prior to the commencement of the Company’s Chapter 11 case that have not been paid will be resolved through the Company’s Plan of Reorganization which requires Court approval and has yet to be submitted. Interested parties can find updates and additional information at the Company’s website at www.mesa-air.com/restructuring. Imperial Capital is serving as financial advisor, and Pachulski, Stang, Ziehl & Jones LLP is serving as legal counsel to the Company and its subsidiaries in connection with the restructuring. Mesa currently operates 130 aircraft with approximately 700 daily system departures to 127 cities, 41 states, Canada, and Mexico. Mesa operates as Delta Connection, US Airways Express and United Express under contractual agreements with Delta Air Lines, US Airways and United Airlines, respectively, and independently as Mesa Airlines and go! Mokulele. This operation links Honolulu to the neighbor island airports of Hilo, Kahului, Kona and Lihue. The Company, founded by Larry and Janie Risley in New Mexico in 1982, has approximately 3,500 employees. Statements contained in this press release that are not historical facts may be forward-looking statements as that term is defined in the Private Securities Litigation Reform Act of 1995. Forward-looking statements involve risks and uncertainties that could result in actual results differing materially from expected results and represent the Company’s expectations and beliefs concerning future events based on information available to the Company as of the date of this press release. The Company undertakes no obligation to publicly update or revise any forward-looking statements to reflect events or circumstances that may arise after the date of this press release. Additional information regarding risk factors that may affect future performance at the Company are contained in the Company’s SEC filing, including without limitation the Company’s Form 10-K for its fiscal year ended September 30, 2008.